Doctor Strange is going for $24 (3D, bluray, DVD, digital) today via eBay deal. Amazon UK has Jurassic World 3D for about $8.31 and Jurassic Park 3D for about $9.75. Prices are shipped and both are region free. Pretty solid deals if you don't already have the 3D versions. Best Buy has Force Awakens for $23 which is 12 off. Still kind of pricey for a double dip but considering it may be top 5 in terms of presentation if you have a 3D player it's highly recommended. It is also the only set that includes director commentary... definitely the best set available for TFA. People looking for Rogue One 3D, wait for the double dip. Target/BB 3D sets don't have commentary. Minions 3-D is $11.99 on Amazon right now. Glad I didn't get the 2-D only version offered over BF period. For those who don't have them, the previous two Despicable Mes are $14.99. SW: TFA is off the chain on my LG OLED. I remember seeing this in the theater in IMAX 3D and the 3D quality was meh. The disc on a high end OLED display has AMAZING depth and detail. Go see Ghost in the Shell in 3D, i was blown away by the effects! Movie was awesome too! What's the best deal for Star Wars: Rogue One 3D? I am not too worried about Steelbook covers or Target exclusives though I won't argue with them if it is the best deal. The Best Buy steelbook is $24.99 but may start to become a little hard to find (most stores in my area appear to be sold out or have under 3 in stock). Not sure the Target price but I think it may be a little bit more. Target also has a $10/$50 sale on Star Wars stuff. Not sure what happens if you buy 2 copies to get the discount and return one (i.e. If it will just take $5 off each). why is the 3D version so rare for Rogue One? It's not "rare". When the home video announcement was made it was announced that only the Target and BB exclusives had 3D. Looks like BB steels in my area are sold out (no surprise) but Target is still available in store and online. Looks like all the Best Buys near me are also sold out of the Rogue One 3D steelbook. There are a bunch of 3D movies on sale at Best Buy this week for $9.99 each. I picked up Walking With Dinosaurs The Movie 3D as I've never seen that below $30. Any recommendation for 3D movies from Best Buy's sale? Dawn of the Planet of the Apes and especially X-Men Days of Future Past are steals at that price. They're summer action movies with a brain: entertaining, but also make you think. Life of Pi is also an excellent 3-D showcase, and a reminder that sometimes Ang Lee's pretentiousness pays off (it earned him a Best Director Actor). Book of Life is an unusual animated film based around Mexican traditions that both kids and adults will like, and if you're a fan of the X-Men films, you can't go wrong with The Wolverine. However, unlike Days, which anyone will enjoy, those who are not fans of past X-Men films will not find as much to like there. I noticed Fantastic Beasts, releasing Tuesday, does not have a home 3-D release. Hope this is not the start of a disappointing trend. Fantastic Beasts came out a few weeks ago with 3D version available. Not sure where you are getting your info. I was able to place an order. Guess they didn't have many copies. If the Thor and Guardians of the Galaxy taught anything, its that BB 3-D steelbooks sell out fast. If you don't go the day it comes out, you might not get it. Fortunately, they've improved their stock since the Thor/Guardians days, when each sold out shortly after stores opened (and began selling on Ebay for three times the original price). I couldn't get to BB for Rogue One until after work, which was less than three hours until closing time, yet I was able to get one for myself and one for a friend, and there were still quite a few left. 24 hours later I'm sure that would not have been the case. 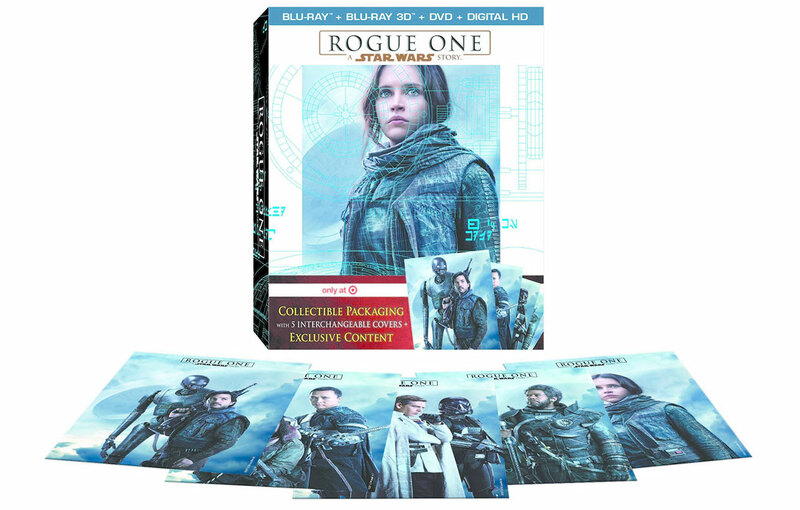 Rogue One doesn't even have a non steelbook 3D version, so it got a larger shipment than other titles.